Samsung already seems to have made plans to launch a Samsung Galaxy S IV Mini to followup the successful launch of Galaxy S IV in the world market. 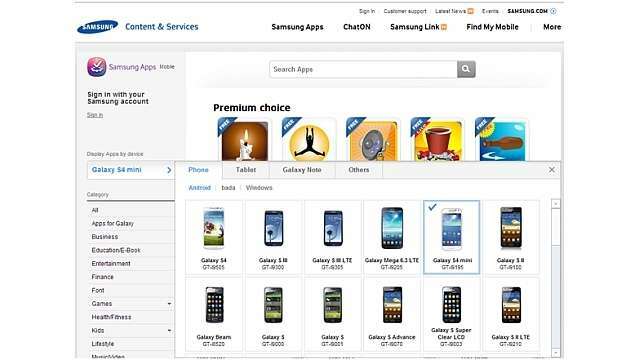 You watch the image closely you can see that the 5th smart phone is listed as Galaxy S4 Mini. While there were rumours about Samsung launching Mini S4 but nothing concrete had come of the rumours. However Redmond Pie managed to take the above screenshot and post it online. But when I visited the site, it was taken off. So maybe somebody looking after the Samsung App website accidentally included the device in the list. But that said and done, Samsung Galaxy S IV Mini is indeed a reality now and hopefully will be a cheaper and smaller version of the flagship phone. This is good news for people who want a Samsung S4 but cant afford $650.00 + or (INR 40000.00+) for the same or for those who feel S4 is too big for their pockets! Though the specs aren't available just yet, earlier this month S4 Mini specs had made appearances on the forums. And as per those leaks the Mini will boast of 4.3 inch screen with a much lesser 256 ppi density compared to its big brother. It will also not be sporting the famous Exynos 5 Octa 5410 chipset that the S4 has, but rather have a much subdued dual core 1.6 GHz running aboard. I will keep you abreast of any information on the Mini. Kindly write in your comments on this article.